6869 Quinjet Aerial Battle is a Marvel Super Heroes set released in April 2012. It consists of a model of the Quinjet, a vehicle used by the Avengers, and a small flying chariot used by Loki. It contains the minifigures Black Widow, Iron Man (Mark VII), Thor, Loki, and an Alien Foot Soldier. This set includes the Quinjet for The Avengers, piloted by Black Widow, which includes flick fire missles, a mini-jet, and a prison pod. Also included is a chariot for Loki, driven by an Alien Foot Soldier. The Quinjet has two large wings with movable wingtips, two large movable jet engines with fins at it's back, and two opening cockpits at it's front, which would appear to be attached onto the rest of the ship, rather than built as part of it. In the middle, there is a cockpit-like prison, and it appears that it can fit about 2-3 minifigures. By pressing the button just behind the main cockpit, the minijet is deployed out the bottom. At the rear is a lowering boarding ramp. The Quinjet also has landing gear and four flick missiles. Loki's Flying Chariot consists of two main parts. The first of these is a steering section, in which the Alien Foot Soldier stands, and from which two weapons protrude. The Foot Soldier is partially protected by a shield attached to the section's front, printed with an alien design. The Chariot's second section is the passenger section where Loki stands, which is raised using slope pieces. In the adventure, Black Widow, Thor, and Iron Man are aboard the helicarrier and notice an explosion in the distance. Thor and Black Widow fly in the Quinjet with Iron Man flying alongside. they discover Loki on his chariot with a Alien Foot Soldier. A battle between them ensues. Captain America, Black Widow and Hawkeye all jump in the Quinjet to escape from the Helicarrier and arrive in New York in time to stop Loki. However, by the time they get there, Loki has already unleashed his army of Chitari on New York. They defeat mass groups of Chitari alongside Iron Man until they are shot down while flying too close to a skirmish between Thor and Loki. Captain America, Black Widow and Hawkeye narrowly escape as the Quinjet crashes and explodes, and Loki escapes on a Chitari Chariot. After the arrival of Bruce Banner/The Hulk, the Avengers fight their way to victory and Loki is sent back to Asgard. This is a description taken from LEGO.com. Please do not modify it. 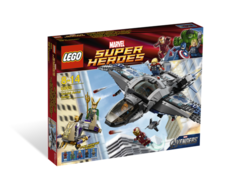 (visit this item's product page) Defeat Loki and his forces with the super fast Quinjet! Rotate the Quinjet wingtips 360 degrees! Load the captured badguys into the Quinjet's prison pod! This set includes a "comic adventure" numbered at four. Black Widow is exclusive to this set, as well as the Mark VII version of Iron Man. In the June 2012 LEGOshop.com magazine, Iron Man is Mark VI instead of Mark VII in the minifigure lineup. Facts about "6869 Quinjet Aerial Battle"
This page was last edited on 29 April 2016, at 16:11.